My table saw is the centerpiece of my workshop. But for being king of the castle, it doesn’t offer a lot of storage for all of the extras that I regularly use. I decided to make a storage cabinet for a new cross cut sled that also has an extension wing for cutting larger panels. Many people have asked me about the cross cut sled that I use in the videos. I made it long time ago and never showed it was done. 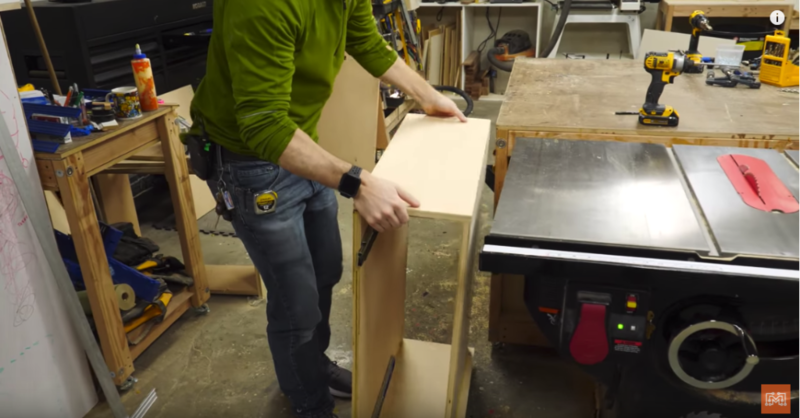 If you aren’t familiar, a cross cut sled is a squared jig that wood can ride on that will result in a perfectly 90 degree cut on the table saw. I used a lot of laminated plywood pieces pocket-holed together to make a front and back fence. These fences were attached to a plywood bottom panel. To ensure that it consistently runs straight along the saw blade, you attach thin strips of wood to the underside that ride in the table saw’s miter slots. That is basically it, a sled made of flat wood that runs in the miter slots, except that it isn’t perfectly straight yet. To square up the back fence for consistent cuts, you use the “5-cut method.” My cross cut sled was as close as I cared to get it, but be as exact as you like. Once the sled was square, I added some paste wax to the underside so it slid smoothly across the saw. 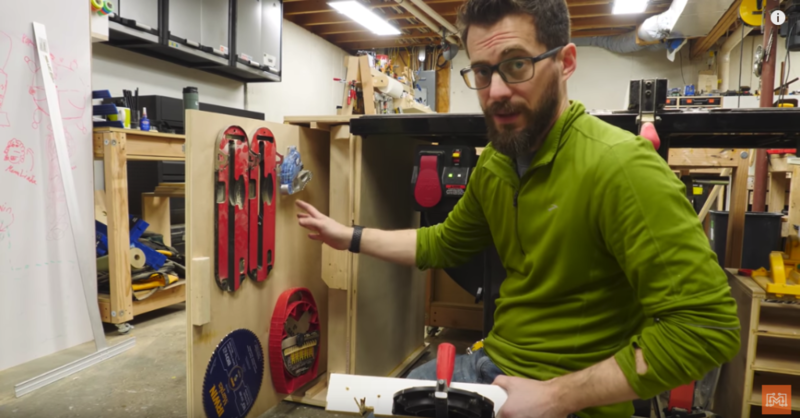 The idea behind this cabinet is that it would be a place to store the cross cut sled as well as other table saw items; extra blade, throat plates, my dado stack, and even my adjustable miter gage. 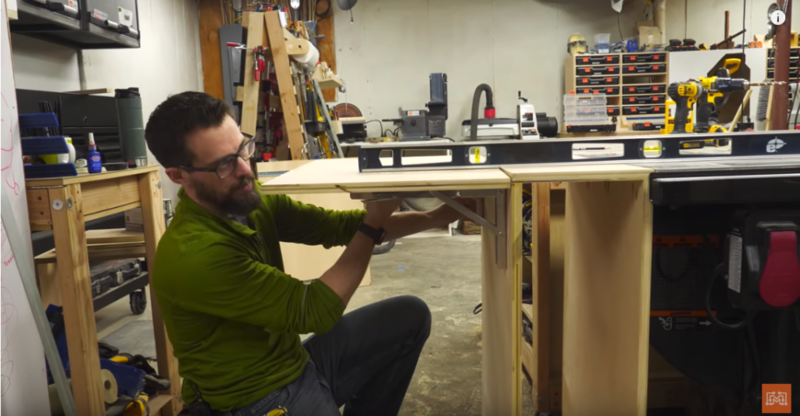 There is room under the existing table saw extension to the right of the saw, but I thought I could use this cabinet to extend the saw’s surface to the left as well. I build a simple box on top of a wider platform with some drawer slides mounted on one side. The extra width at the bottom would allow for some adjustable feet underneath the cabinet without poking through the interior space. I also added some threaded inserts to the spot where the cabinet touched the table saw. The cast iron wing on my saw had some extra holes on that side so I could run a bolt through the saw and into the new extension cabinet. Using the adjustable feet, I made the top of the cabinet flush with the top of the saw and bolted them together. Besides having room for the cross cut sled, I added a few drawer slide to the interior space to accept a sliding storage panel. This shelf would hold all of the other things I use on the table saw. Now, you could totally make some custom holders for blades or other items, but I’m super simple and just used some screws. I made a simple handle out of a scrap 2×4 and the interior storage space was finished! Having the cabinet’s extra surface space is nice, but it isn’t quite big enough. I struggle with wrangling a full sheet of plywood on my table saw when ripping pieces. By adding a flip-up extension wing, I can now rip pieces off of a full sheet without it awkwardly tipping off the side fo the saw. The brackets I used to lift up the wing are rated for 300 lbs each, so I’m totally not worried about it collapsing under the weight of a semi-supported sheet of plywood. I really love this new shop fixture. It solved a few problems I had with organization and saw capacity. 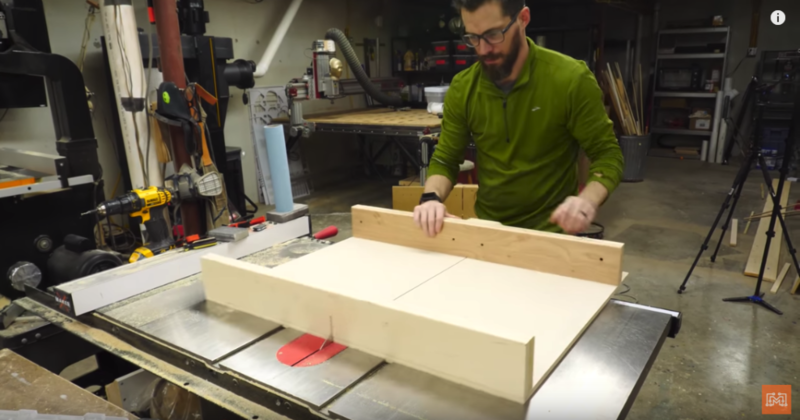 Building a new, more accurate cross cut sled was an added bonus that rounded out the project. This cabinet can work for any saw you may have. If you use a contractor saw that folds up, the cabinet can be bolted to the side of it as well. If there aren’t any hole in the end of the saw wing, you could just clamp it together from underneath. If you are interested in making one of these extension wing cabinets for your saw, check out the link to the plans down below!